A new commentary paper published in Diabetic Medicine has reported diabetic foot disease to be one of the leading causes of disability across the world. The paper – authored by DFA’s Dr Pete Lazzarini and A/Prof Jaap van Netten and DFA’s friends A/Prof Rosana Pacella and Prof David Armstrong – has already received media attention with its claims that diabetic foot disease causes more global disability than heart disease, kidney disease and stroke. But, as we always say here at DFA, is this really the full story? What do we know about the global diabetic foot burden? For a while now many authors have suggested that diabetic foot disease causes a large global burden of disease. This is probably because we have also known for a while that diabetic foot disease is the leading cause of global amputations and has mortality rates worse than many cancers. More recently we have discovered that diabetic foot disease is also a leading cause of all doctors’ visits and hospital admissions. 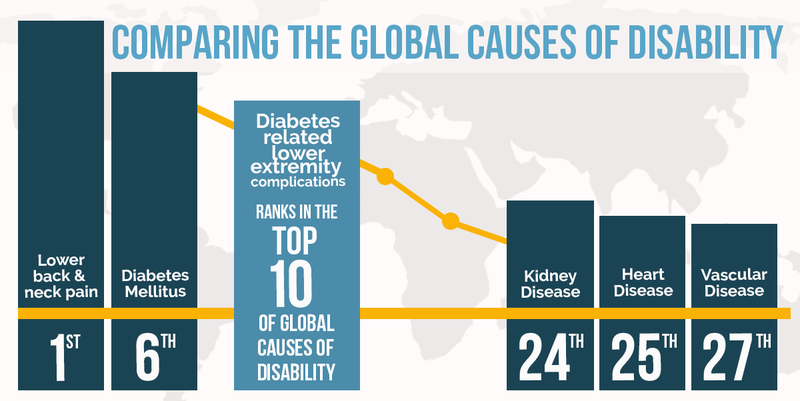 So, with all that perhaps we shouldn’t be surprised with this recent news that diabetic foot disease is a leading cause of global disability. But, up until now, no one had formally compared the global burdens caused by diabetic foot disease with that of other conditions. In short, the authors used disability data published in the Global Burden of Disease (GBD) Study to estimate the global burden of disability caused by diabetic foot disease and compared it to ~3,000 other conditions (various diseases, injuries and complications). The GBD Study is regarded as the most prestigious study that quantifies the global burden of disease caused by all conditions. Each year GBD publishes an update of the global disability, death and disease burdens for these conditions in the globe’s leading medical journal, The Lancet. To estimate these burdens, GBD uses the latest most robust epidemiology data available, in combination with some fancy algorithms, to transform this data into specific measures: years lived with disability (YLDs) (disability), years of life lost (YLL)) (death) and disability-adjusted life years (DALYs) (total disease burden). One DALY represents one year of healthy life lost and is the sum of YLDs and YLLs. In 2016, the GBD Study on disability also broke up the disability caused by diseases into different complications for the first time; unfortunately they didn’t also do this for death. Diabetes was broken up into many complications, including diabetic peripheral neuropathy, foot ulcers and amputations. So, for the first time ever, the authors could use this GBD data to estimate the global disability burden caused by what they collectively called “diabetes-related lower-extremity complications”. First, they looked at the numbers of people affected and found ~159 million people had diabetic foot disease (2.2% of the global population); i.e. either diabetic peripheral neuropathy, foot ulcers or amputations. When they compared this to all other conditions, they found diabetic foot disease ranked in the top-40 of all conditions for numbers of people affected. It affected less than those affected by all diabetes (5.9%) and kidney disease (4.4%), but more than heart disease (1.5%) and stroke (0.6%). Second, they looked at disability and found ~20.5 million YLDs (~2.6% of all global YLDs) were caused by diabetic foot disease. When they compared this, they found diabetic foot disease ranked in the top-10 conditions for numbers of YLDs caused. It caused less YLDs than all diabetes (33.4 million YLDs), but more than kidney disease (8.2 million), heart disease (7.3 million) and stoke (6.5 million). They displayed this comparison in a nice figure which we have jazzed up with permission here. What was good and not so good about this paper? This paper had many strengths, including: i) used independent robust GBD Study data; ii) compared all conditions using the same processes and measures; and iii) the authors have expertise with authoring GBD Studies and global diabetic foot burden studies. But, this study was not without limitations, including: i) the paper was commentary letter which means we are reliant on the authors expert interpretations; ii) they used GBD data for diabetic peripheral neuropathy to help estimate diabetic foot disease and we know that some neuropathy disability affects the arm, so this may have caused them to over-estimate the burden; ii) but, on the flip side they did not use GBD data for other diabetic foot complications such as diabetes-related peripheral arterial disease, cellulitis and pressure ulcers, so this means they were probably more likely to under-estimate the burden; iii) GBD data relies on pooling epidemiology data from other studies and thus their estimates can fluctuate over time; and iv) GBD includes diabetes-related kidney disease as its own condition separate to diabetes, so this means that the combined diabetes burden is under-estimated. The authors sum this up nicely concluding, “we estimate that the disability burden caused by DRLECs (diabetic foot disease) would rank within the top-10 leading causes of the global disability burden …. With DRLECs also resulting in mortality rates worse than many cancers, we recommend future GBD publications should present YLD, YLL and DALY estimates … to highlight the potentially significant overall global burden of DRLECs to policymakers”. In short, this means that diabetic foot disease appears to be a leading cause of global disability and is increasing at a very rapid rate compared to other leading causes. The authors go on to recommend to “prioritise policies that improve evidence-based care for people with DRLEC, and thus, potentially reduce a large cause of the global burden of disease”. Obviously, we could not agree more! This new paper is a very timely reminder during this year’s It’s about time National Diabetes Week Campaign that It’s about time to put your feet first as per DFA’s National Diabetes Week campaign. In fact, with diabetic foot disease now a leading global condition when it comes to numbers of people affected, doctors’ visits, hospital admissions, amputations, death and now disability we would suggest it is well and truly over-time for everyone to put feet first.